The ADVANCED TASER® is a less-lethal weapon. It is designed to incapacitate a target from a safe distance without causing death or permanent injury. While the medical evidence strongly supports that the ADVANCED TASER® will not cause lasting after effect or fatality, it is important to remember that the very nature of physical confrontation involves a degree of risk that someone will get hurt or may even be killed due to unforeseen circumstances and individual susceptibilities. Accordingly, the ADVANCED TASER® should be treated as a serious weapon and should only be deployed in situations where the alternative would be to use other force measures which carry similar or higher degrees of risk. NEVER POINT THE ADVANCED TASER® AT ANOTHER PERSON UNLESS INTENDING TO USE. NEVER AIM THE ADVANCED TASER® AT THE EYES OR FACE. KEEP THE ADVANCED TASER® OUT OF THE REACH OF CHILDREN. IN ORDER TO EXTEND THE WEAPON LIFE, AVOID DROPPING UNIT. KEEP HANDS AWAY FROM THE FRONT OF THE UNIT AT ALL TIMES UNLESS THE SAFETY SLIDE IS FORWARD AND THE ADVANCED TASER® IS DEACTIVATED. NEVER TILT THE ADVANCED TASER® WHEN FIRING (unless you are firing at a target laying on his side). IF GOING ON AN AIRPLANE, YOU MUST PUT THE ADVANCED TASER® IN YOUR CHECKED LUGGAGE, IT CANNOT BE CARRIED ON BOARD. ALWAYS REPLACE AIR CARTRIDGES BY THE EXPIRATION DATE PRINTED ON EACH AIR CARTRIDGE. DO NOT FIRE THE ADVANCED TASER® NEAR FLAMMABLE LIQUIDS AND FUMES. THE ADVANCED TASER® CAN IGNITE GASOLINE OR OTHER FLAMMABLES. SOME SELF-DEFENSE SPRAYS ARE FLAMMABLE AND WOULD BE EXTREMELY DANGEROUS TO USE IN CONJUNCTION WITH ADVANCED TASER®. THE ADVANCED TASER® CAUSES TEMPORARY PARALYSIS. THIS PARALYSIS CAN BE DANGEROUS AND EVEN FATAL UNDER SPECIFIC CIRCUMSTANCES. FOR EXAMPLE, SOMEONE TASER®ED IN A SWIMMING POOL WOULD PROBABLY DROWN AS THEY COULD NOT SWIM OR SUPPORT THEMSELVES. DUE TO POTENTIAL DANGERS, ONLY USE THE ADVANCED TASER® WHEN ABSOLUTELY NECESSARY TO PROTECT YOUR LIFE. ALWAYS MAKE CERTAIN YOUR SAFETY SLIDE IS IN THE LOCKED POSITION WHENEVER YOUR ADVANCED TASER® IS LOADED AND NOT INTENDED FOR IMMEDIATE USE. WHEN CARRYING THE ADVANCED TASER®, STORE IT IN AN ENCLOSED CONTAINER FREE FROM OTHER ITEMS WHICH MAY INTERFERE WITH OR UNLOCK THE SAFETY. IT IS RECOMMENDED THAT YOU CARRY THE ADVANCED TASER® ONLY IN A CERTIFIED HOLSTER OR CARRYING CASE. CONTACT THE COMPANY FOR DETAILS ON HOLSTERING ACCESSORIES. WHAT IS THE ADVANCED TASER®? The ADVANCED TASER® is a conducted energy weapon that utilizes compressed nitrogen to shoot two small probes up to 15 or 21 feet (21 foot cartridges sold to law enforcement agencies only). These probes are connected to the weapon by high-voltage insulated wire. When the probes make contact with the target, the ADVANCED TASER® transmits powerful electrical pulses along the wires and into the body of the target through up to two inches of clothing. The ADVANCED TASER® is the third generation of TASER® technology conducted energy weapons. Conducted energy weapons use electrical energy to effect the signaling mechanisms used by the human body to communicate. This electrical output simply "jams" the communication system of the body. The ADVANCED TASER® sends a series of electrical signals called TASER® Waves or T-WavesTM quite similar to those used by the brain to communicate with the body. Much like radio jamming, the T-Waves overpower the normal electrical signals within the body's nerve fibers. The human target instantly loses control of his body and cannot perform coordinated action, falling to the ground. There are two categories of conducted energy weapons: Stun weapons and Electro-Muscular Disruption Weapons. The original, first generation TASER® was introduced in 1974. This system used a 7 Watt TASER®-wave discharge to stun the target. Stun technology weapons operate in a 7-14 Watt range and interfere with the communication signals within the sensory nervous system of the target, Hence, they create a stun effect by overwhelming the nervous system with electrical interference. The brain, over-stimulated by the electrical energy, is stunned and the target is usually immobilized. These 7 Watt systems have an effectiveness rating of approximately 86%. TASER International introduced the second generation of TASER® technology with a 7 Watt output in 1995: the AIR TASER® 34000 series. The 2nd generation 34000 series improved on the 1st generation 21 by reducing the size and weight by over 50%, adding battery level indicators, and adding an automatic discharge timer. For more information on the 34000 series, contact your TASER International dealer. 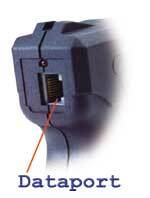 In 1999, TASER International introduced the 3rd generation of TASER technology with the ADVANCED TASER®. Unlike the earlier 7-Watt stun systems, the ADVANCED TASER® operates at over 14 Watts with a newly developed TASER®-wave output. These higher-powered systems not only stun the target; they directly control the muscles, causing an uncontrollable contraction. Hence, conducted energy weapons with power output greater than 14 watts are designated as Electro-Muscular Disruption (EMD) weapons due to the fact that they directly control the skeletal muscles. This EMD effect causes an uncontrollable contraction of the muscle tissue, allowing the M-Series to physically debilitate a target regardless of pain tolerance or mental focus. Prior to the launch of the M-Series, over 60 elite volunteers from SWAT teams, military Special Forces, and police agencies were hit with the ADVANCED TASER® M-26 (26-Watt system) with a 100% incapacitation rate. Each individual was immobilized in less than 1/2 second. The ADVANCED 21 are the first less-lethal weapons that can stop these focused, goal oriented individuals. All 3 generations of TASER® technology operate at approximately 50,000 volts. However, the output power measured in watts is significantly different. 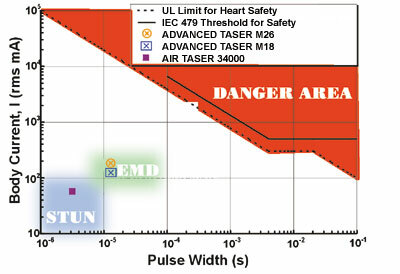 The voltage may seem high, however, the ADVANCED TASER®'s output is well below a potentially dangerous level. Studies have shown there are no long-term effects from being shot by TASER® technology. A study performed at the University of Southern California Medical Center concluded that in addition to its non-lethality, the TASER® leaves 0% long-term injuries. (This test was conducted on the 7 Watt stun systems). Field studies of TASER® technology have shown these less-lethal weapons can significantly reduce injuries to both suspects and officers. A leading field study of 7 Watt TASER® Technology at the Los Angeles Police Department found TASER® technology had the lowest rate of injuries to both officers and suspects compared to all other force options studied. More information on this data available at http://www.home.earthlink.net/~gregmeyer/injury.html. Studies on over 70 human test volunteers of the ADVANCED TASER® supported that the injury rate remains at 0% long term effects even at the full 26 Watt output. When the ADVANCED TASER® is fired, its Intelligent Electronics System fires the T-Waves for 5 seconds. The number one reported reason for failure in the 1st generation TASER® system was that officers would release the trigger switch (which stopped the power on the 1st generation system). Thus, the officer would mistakenly release power too quickly, before the target was immobilized. In the ADVANCED TASER®, the unit runs automatically for 5 seconds to eliminate this issue. The operator can turn the unit off at any time by simply switching the safety back to the safe position. The ADVANCED TASER® M26* and M18L models come standard with a built-in laser. This laser will activate automatically when the safety is armed. The M18 model does not include the laser. In addition to providing the most effective takedown power available, the ADVANCED TASER® M26* provides revolutionary weapon management technology. The M26* has a data port located on the back of the unit. Every time the M26* is fired, it stores the time and date when it was fired. This data protects officers from claims of excessive use of force by providing complete and accurate documentation of the time and date for each firing. The M26* also provides law enforcement with a powerful management tool to track usage patterns and prevent misuse. Data downloads to any Windows® 95/98 compatible computer (special adapter cable required). For more information on Data port download software and cables, contact your local dealer. The dataport is not available on the M18 or M18L. 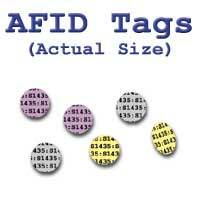 Every time an Air Cartridge is fired, up to 40 small confetti-like ID tags called AFIDs are ejected. Each AFID is printed with the serial number of the cartridge fired, allowing departments to determine which officer fired the cartridge. The ADVANCED TASER® runs on 8 standard AA alkaline battery. (The Energizer® battery is strongly suggested based upon testing). Before installing the batteries, make sure the safety is in the SAFE position and that the ADVANCED TASER® is unloaded (i.e. no cartridge is installed). To load the batteries, simply depress the battery cover lock pin with a handcuff key or pen and slide the battery cover forward, out of the handle. Remove the battery magazine from the handle. Load battery magazine: The battery magazine has a special design with springs at both ends. This provides better battery performance. To load the batteries, follow the picture inside the magazine bays for orientation. First, load the ends of the batteries towards the springs as shown below forming a "V", then push the two batteries together into place. After loading 8 AA batteries in the magazine, reinsert the magazine such that the contacts on the top of the magazine are aligned with the contacts inside the unit. The magazine will not load fully into place unless inserted correctly. Finally, while holding the magazine in place with your thumb, slide the cover back in place. 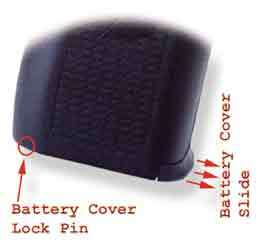 You will have to depress the cover lock again to allow the cover to slide over it. Once the battery is in place, you can test to make sure it is in correctly by activating the battery checker. WARNING: AS SOON AS THE SAFETY IS ARMED, THE UNIT IS LIVE, SO BE CAREFUL. DO NOT PUSH THE TRIGGER SWITCH UNTIL YOU HAVE READ FURTHER. To activate the battery checker (make sure it is pointing in a safe direction -- away from people), simply flip up the safety. If the battery is in place correctly, you will see a flashing red heartbeat light on the back of the unit above the dataport. 1. Always keep your fingers away from the front of the unit unless the safety is locked down in the safe position and the flashing heartbeat light is out. Never put your fingers on the shaded area shown in the illustration and never try to remove an Air Cartridge unless the Safety is in the locked position. This area will emit T-Waves whenever the unit is firing, so do not touch this area or you could get stunned. ALWAYS HAVE THE SAFETY LOCKED DOWN IN THE SAFE POSITION BEFORE REMOVING AIR CARTRIDGES OR TOUCHING A LOADED AIR CARTRIDGE. A. Hold the unit with fingers away from the front area. B. Flip up the safety to the armed position. Before pressing the Trigger Switch, remember the unit will fire for 5 seconds automatically unless you flip the safety down to turn it off. C. Press the Trigger Switch. D. Flip down the safety to turn the ADVANCED TASER® off. Once the unit has fired for a second or two, we suggest you flip the safety down to the off position. Do not allow the unit to go through the entire timing cycle as this will deplete the batteries unnecessarily. AS SOON AS THE ADVANCED TASER® IS LOADED WITH AN AIR CARTRIDGE, IT WILL FIRE AT THE TOUCH OF THE TRIGGER SWITCH IF THE SAFETY IS UP. TREAT IT VERY CAREFULLY. DO NOT POINT AT PEOPLE UNLESS INTENDING TO FIRE. The Air Cartridges are very easy to load and unload. To load, simply take an Air Cartridge and snap it into the front of the unit. The photograph below shows the AIR TASER® model 34000 being loaded with an AIR CARTRIDGE -- the ADVANCED TASER® loads the same way. The Air Cartridge has been specifically designed so there is no "up" or "down" position - enabling you to quickly reload it in a stressful situation without worrying about putting it in upside down. Hold the ADVANCED TASER® evenly, so the top surface is level and parallel to the ground. Do not tilt the unit as this could cause the bottom probe to miss the target. The bottom probe is aimed slightly downward, and if you turn the ADVANCED TASER® at an angle, the bottom probe will not fire downward but will fire off to the side resulting in a miss. To unload the Air Cartridge, first make sure the Safety is down in the safe, locked position. If you touch the Air Cartridge while the unit is firing, you will be zapped by the stun gun on the front. Once you have pushed the Safety down, simply squeeze on the two round release buttons on the side of the Air Cartridge and pull it out. You can now reload with another Air Cartridge. It's that simple. The probes, the compressed air, and the TASER® wire are all contained in the Air Cartridge -- all you have to change is the Air Cartridge to be ready to shoot again! NEVER ATTEMPT TO OPEN AN AIR CARTRIDGE PRIOR TO FIRING -- THEY ARE DESIGNED TO BE FIRED BY THE POWER HANDLE ONLY AND TAMPERING WITH A LIVE AIR CARTRIDGE COULD CAUSE IT TO FIRE OR MALFUNCTION. 1. Set up the target in a location where there are no hard objects. Set up a practice target on a cardboard, corkboard or dry wall area or use a firing range. Make sure there are no metal objects behind the target or right around it that could cause a ricochet. 2. Learn to judge 21 feet. It is much farther than most of us imagine. Get a tape measure and measure out 21 feet from the target. In most rooms, you will not be able to get that far away. This is more than enough distance to keep an attacker well away from you. However, know your limits and never fire the ADVANCED TASER® at a target more than 21 feet away. The optimum range for the ADVANCED TASER® is 7 - 10 feet. If possible, try to fire the ADVANCED TASER® when your target is between 7 and 10 feet away for best results. For practicing, 7 feet is the best distance. From the target, take 2-3 large paces back. In a real confrontation, you should always try to fire the ADVANCED TASER® from at least 3 feet away from the target. While it will work from 0-21 feet, it is better to give the probes a little room to spread apart as they come out. So, always try to fire while the attacker is still at least 3 feet away. 3. Always hold the ADVANCED TASER® level when firing. NEVER TILT THE UNIT SIDEWAYS. The ADVANCED TASER® fires out 2 probes. The first probe will go where you are aiming (center of the chest). The second probe is aimed slightly down so the probes spread apart and can inject T-Waves into a greater area of the target, making it more effective. If you tilt the ADVANCED TASER®, it will misdirect the bottom dart. 4. Use the fin and blade sight on the top of the ADVANCED TASER® to aim similar to a firearm. Or, simply use the laser sight to aim. However, it is important that you learn to aim without the laser sight in case you need to deploy the ADVANCED TASER® in bright lighting conditions where the laser dot may not be visible. 5. Fire. Flip up the safety (notice the flashing red light indicating the unit is armed). Next, aim at the center of the target and gently press the Trigger Switch. There will be a popping sound, but there is no "recoil" (you will not feel any kick from the ADVANCED TASER® as it fires). Notice the T-Waves on the surface of the practice target. The T-Waves will not be visible in a real confrontation because they are absorbed by the body of the target. When you are ready, flip down the safety before removing the Air Cartridge. AGAIN, ALWAYS KEEP YOUR FINGERS AWAY FROM THE FRONT OF THE ADVANCED TASER® UNLESS THE SAFETY SLIDE IS IN THE DOWN POSITION. NEVER ATTEMPT TO REMOVE THE YELLOW BLOW OFF DOORS ON THE AIR CARTRIDGE. For replacement Air Cartridges, please contact your ADVANCED TASER® dealer or call 1-800-418-0283 or 1-800 97-TASER® for ordering information. Accessories are available for your convenience in carrying or storing the ADVANCED TASER®. For details, see your dealer. 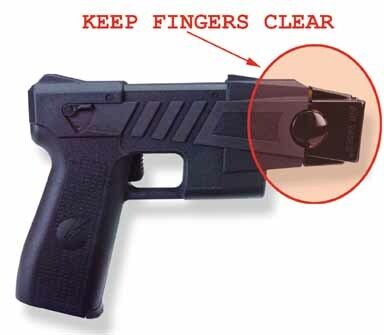 To use the stun gun AFTER FIRING an Air Cartridge, press down the Trigger Switch (make sure the Safety Slide has been pulled back) to ensure the unit is active, then press the front of the ADVANCED TASER® firmly against the body of an assailant. It does not matter whether the Air Cartridge is in or not. The ADVANCED TASER® works as a stun gun with or without the Air Cartridge in place. Even with the Air Cartridge in place, the metal prongs on the front of the ADVANCED TASER® will deliver T-Waves directly to the body of the target. Shown below are the most effective places to use the stun gun. If the attacker is in front of you, you should attempt to press the ADVANCED TASER® right into the center of his chest, or into the nerves under his chin. Note: If the attacker is touching you, the T-Waves will not transmit to you from the attacker. The T-Waves directly travel between the two probes. Arm the device by flipping up the safety. Aim for the center of the chest of the subject. Fire -- simply press down the Trigger Switch to fire the probes. If the subject is not down or there are multiple subjects (or you are attacked from behind), hold the unit firmly and prepare to use it as a stun gun. The ADVANCED TASER® can be used as a stun gun with the used Air Cartridge still in the power handle or with the cartridge out of the power handle. However, if there is an unused cartridge in place, you cannot use the ADVANCED TASER® as a stun gun because it will fire the probes when activated. Once the probes have been launched you can use the ADVANCED TASER® as a stun gun. 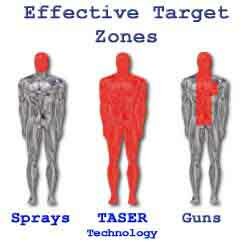 The ADVANCED TASER® is a serious, state of the art, defensive weapon and should treated accordingly. Although the unit is designed to be as nonviolent as possible in stopping a combatant, its use can result in serious injuries such as getting a probe stuck in an eye, or injuries related to falling. Be sure, however, not to fire at an attacker who is over 21 feet away (measure 21 feet to see how far this is -- it will probably be farther than you think). If you do fire at someone more than 21 feet away, the probes will not have sufficient TASER® wire to reach the target LAW ENFORCEMENT OFFICERS: REFER TO YOUR DEPARTMENT'S USE OF FORCE POLICY. While the ADVANCED TASER® should be kept somewhere accessible so you can get to it quickly, it must also be kept well away from children if you are storing it at home. In general, we recommend you treat the ADVANCED TASER® exactly as you would a gun -- find a place to store it or keep it so it is accessible only to you, but not to children or other people unfamiliar with its use. TASER® International, Inc. offers a series of accessories such as belt holsters and car clips which can help you keep your ADVANCED TASER® accessible and ready for convenient use. Simple rule -- only leave the ADVANCED TASER® somewhere you would leave your pet. It is designed for temperatures from 20 degrees to 114 degrees. The temperature limitations for the ADVANCED TASER® are a function of the battery performance. Battery performance is severely deteriorated below freezing temperatures. Much like a pet dog, you should not leave it in the car in Alaska in the winter nor in your trunk in Arizona in the summer. Extreme temperatures can cause damage to batteries. If the temperature is comfortable for you, it is comfortable for the ADVANCED TASER®. The ADVANCED TASER® has been designed for ease of maintenance. Aside from storing the ADVANCED TASER® in moderate temperatures, you must keep a set of 8 fresh Energizer® AA alkaline batteries in the unit at all times. Always replace low batteries as indicated by the lack of the red flashing light in the battery check system. Also, replace spent cartridges and always be careful to throw out used Air Cartridges where the sharp probes will not injury anyone. Each Air Cartridge has been printed with an expiration date. This date is intended as a safety guideline after which time the Air Cartridge should be replaced. At the time of expiration (normally after 5 years) be sure to fire off the Air Cartridge before disposing of it. Never throw out a "live" Air Cartridge, and especially not into a fire as this could cause the Air Cartridge to explode. After the expiration date, the cartridge needs to be replaced and a fresh cartridge used. This procedure helps to maintain the system for top performance. Never attempt to pry the doors off an Air Cartridge or pry open an ADVANCED TASER®. TASER® technology is so highly effective because the electrical signal penetrates the nervous system regardless of the placement of the probes. The entire human body is covered by the neural net which the ADVANCED TASER® uses to knock out the target. Because the T-Waves can penetrate approximately 2 cumulative inches of clothing, the probes do not have to penetrate the flesh or cause bodily harm to be effective. For a bullet to be instantly effective, it must hit a vital organ such as the heart or brain. Similarly, chemical sprays such as Mace or pepper sprays must hit an assailant in the face -- no easy task in fast moving confrontations. The ADVANCED TASER® can be used more effectively and with less training than most other less-lethal technologies. The nervous systems of animals are greatly different than human beings. The ADVANCED TASER® is designed to be effective on a human attacker. Accordingly, it will not be as effective at incapacitating an animal as it is on a human being. The ADVANCED TASER® should not be used as sole protection from wild, uncontrollable, or attacking animals. Because the TASER® Wave "jams" the communication system of the body, it does not need to cause bodily injury to be effective. It is the nature of the signaling effect within the nervous system that makes it effective. The graph below uses internationally recognized safety guidelines for electrical currents. The safe area is considered safe electrical exposure for 2 year old child or a 75 year old man. Notice the ADVANCED TASER®'s output is less than 1/100th of a potentially dangerous level. Studies have confirmed there are no long term effects from being hit by a TASER®. A study performed at the University of Southern California Medical Center concluded that in addition to its non-lethality, the TASER® leaves 0% long term injuries. This compares quite favorably to the data in the same study concerning the .38 Special handgun. Only 50% of those shot with a .38 Special survived and of those, 100% had permanent injuries. 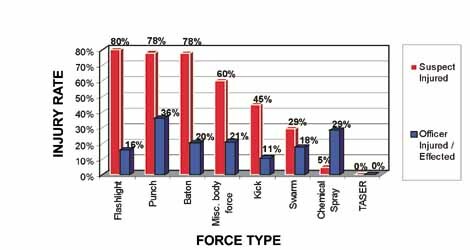 While all of the field studies to date have been conducted with 7 Watt stun systems, the pre-release testing of the ADVANCED TASER® on both human and animal subjects indicates that the ADVANCED TASER®'s enhanced EMD output also leaves no lasting effect. Further, the TASER® output will not damage an implanted pacemaker. Pacemakers are designed to withstand the pulses of electrical defibrillators hundreds of times stronger than TASER® pulses. It can be purchased through mail order from leading law enforcement catalogs and direct shipment. The ADVANCED TASER® restricted from off duty use in the following states: Washington DC, Hawaii, Massachusetts, Michigan, New Jersey, New York, Rhode Island, and Wisconsin. Effectiveness: In prerelease testing, the unit incapacitated 100% of the 70 test subjects. Long Term Effects: None (except for potential eye injuries or injuries related to falling. Optimum Performance: 7 - 10 ft. Backup if probes miss: If 2 launched probes missed, there are 2 stun electrodes on the front of the unit which can be used as a stun gun. Automatic Impulse Regulation: Once the probes are launched, unit stays active for 5 seconds to keep target reliably down. Thickness of Clothing: Up to 2 inches of cumulative clothing, even leather jackets. Recovery Time: Varies by individual -- generally several minutes. Temperature Range: 20 - 114 Degrees Fahrenheit. Weight: 18 ounces (with battery). Battery: AA Energizer® alkaline recommended. Can use rechargeable batteries as well, but battery indicator may not function properly with rechargeable batteries. Patents: U.S. #5,078,117, 5,771,663. Others pending US and worldwide. M26*: 15 pulses per second, 26 Watt output. TASER INTERNATIONAL, INC. herein warrants this product under its "Lifetime Warranty Program" which covers the original registered owner of the product in the following manner and scope. This warranty is conditional upon the return of the enclosed warranty registration card within 90 days of purchase. Should that card not be returned, this warranty is not applicable. Should the original registered owner use the product in the manner prescribed by the manufacturer via the printed instructions and the unit rendered inoperable, the registered owner shall return the inoperative unit to TASER International, Inc. (postage prepaid) with a check or money order for $25 processing and handling fee. A replacement power handle will be sent to the consumer via prepaid postage within the United States. Foreign returns require additional postage fees. Prior to forwarding said unit, the registered owner shall obtain a Returned Goods Authorization Number from TASER International, Inc. by mail or a toll free telephone number at 1-800-41-T-WAVE (800-418-9283). It is the responsibility of the owner to return the product to the manufacturer via prepaid postage and provide written information as to the nature of the defect. Our only obligation under this limited warranty is to repair or replace the product and return it to the customer, via prepaid postage. Warranty provisions apply to the power handle and any unfired air cartridges. Air cartridges that are fired are deemed to have operated properly. Batteries are covered under manufacturers' warranty. The expressed warranties herein are provided by the manufacturer and may not be changed or enlarged by any distributor, dealer or other person whomsoever. To register a claim under this warranty, within the warranty period, mail the ADVANCED TASER® part to: TASER International, Inc., P.O. Box 14463, Scottsdale, AZ 85267, Attn: Warranty Department. Do not mail the entire kit. The foregoing provisions are the only warranty and state the exclusive remedy for any breach of warranty or any other claim in respect to this product. THE EXPRESS WARRANTIES CONTAINED HEREIN ARE IN LIEU OF ALL OTHER WARRANTIES EXPRESSED OR IMPLIED, INCLUDING WARRANTIES OF MERCHANTABILITY AND FITNESS FOR ANY PARTICULAR PURPOSE. IF THE EXCLUSION OF IMPLIED WARRANTIES IS PROHIBITED BY STATE LAW, THEN ANY APPLICABLE IMPLIED WARRANTIES ARE LIMITED TO THE DURATION OF THE EXPRESS WARRANTY DESCRIBED ABOVE. THE PURCHASER AGREES TO ASSUME ALL LIABILITY FOR ANY DAMAGES AND BODILY INJURY WHICH MAY RESULT FROM THE USE OR MISUSE OF THE PRODUCT BY THE PURCHASER OR ANY OTHER PERSON. CONSEQUENTIAL OR INCIDENTAL DAMAGES FOR BREACH OF ANY WARRANTY, EXPRESS OR IMPLIED, ARE SPECIFICALLY EXCLUDED. SUCH CONSEQUENTIAL AND INCIDENTAL DAMAGES SHALL INCLUDE, WITHOUT LIMITING THE FOREGOING, LOSS OF USE, INCOME OR PROFIT, LOSS OF OR INJURY TO PROPERTY OR PERSON. Some states do not allow limitations on how long an implied warranty lasts or the exclusion or limitation of incidental or consequential damages, so the above limitations and exclusions may not apply to you. No representative of TASER International, Inc. or any other person or dealer is authorized to extend the liability of TASER International, Inc. in connection with the sale of its product beyond the terms hereof. This warranty gives you specific legal rights, and you may have other rights which vary from state to state. 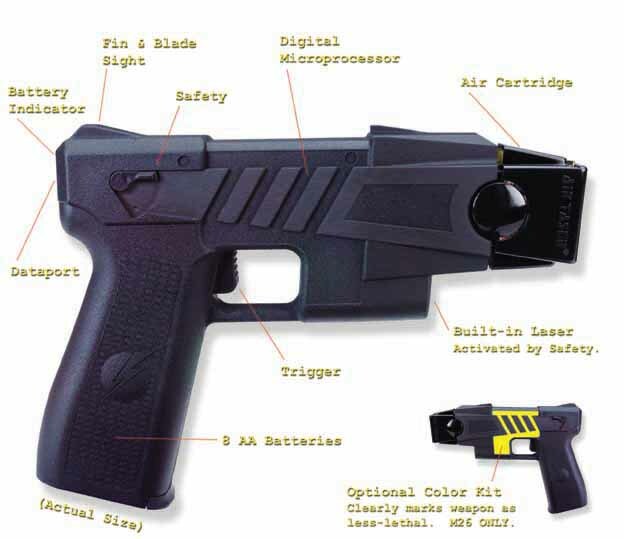 * The TASER® M26 is available to law enforcement only. Taser.org is a Trademark of Internet Company. © 1995-2007 All rights reserved.